Originally I planned to squeeze our one night sojourn to Thirvananthapuram, (which is the capital city of Kerala) into a general synopsis of the last couple days of our India tour. As I actually sat down to go over my notes and photographs, I changed my mind. When I first saw Thirvananthapuram on our itinerary, I had assumed–because it’s such an old city–that it might be something like Calcutta or Madras, crowded and/or hot and dirty (in my eyes at least). I’ve since learned, in fact, that Mahatma Gandhi referred to it as the evergreen city of India because of its rolling coastal terrain. I quite agree. It turned out to be one of the most impressive cities I’ve visited in India, and is a major academic hub. (I’ve always favored university towns!) I was very pleasantly surprised, to say the least. It definitely deserves a post of its own. First, a note on the name. I wonder if others, like me, feel your eyes skim over every time you come across a word with 17 letters like T-h-i-r-u-v-a-n-a-n-t-h-a-p-u-r-a-m (which is a Malayalam word that means “abode of Lord Ananta). I’ve decided that Indian tongues are, by design, far more flexible than mine! To me it’s easily a seven-syllable word, and takes me at least 10 seconds to pronounce. When I write it, I have to go back at least three times to see if I’ve put in enough “a’s”. On the contrary, most Indians can say it in four syllables or less and quite fast at that. I gather that when the British were there, they had similar problems with all those vowels, so seeing as how they were in charge of such things for awhile, they anglicized many of those names. Thus Thirvananthapuram became the three syllable word, Trivandrum, which I find not only easier to pronounce, but easier to spell as well. Officially, it’s now back to the old spelling, but I did notice most of the locals still use Trivandrum as I do. 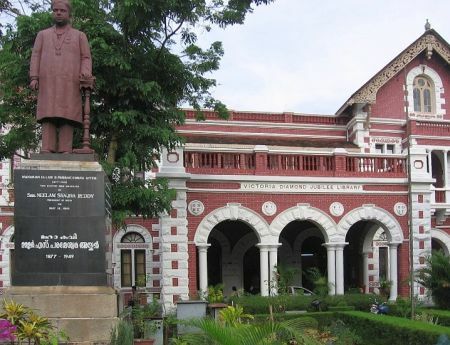 This is the administrative building of the University of Kerala located on Mahatma Gandhi Road across from our hotel. 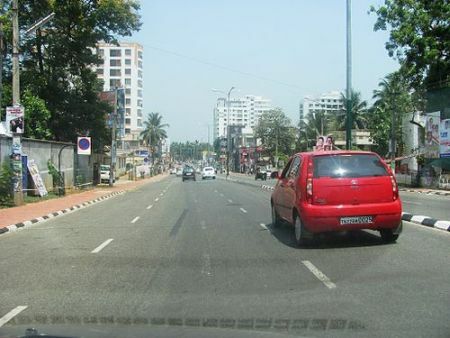 Here are a couple of typical streets in Trivandrum, the top one looking similar to the area where our hotel was located. I’m not sure of the street name here, but our hotel was on the Mahatma Gandhi Road, a major north-south road running through University of Kerala area, on which several colonial period mansions stand. The next street is more typical of the commercial district. Beautiful colonial buildings, don’t you agree? This is the Sri Padmanabhaswamy Temple. Before arriving, I knew only that it was very old and as such was an outstanding example of ancient south Indian architecture. It had the usual crowds of Hindus making pilgrimages to this famous temple dedicated to Hindu Lord Vishnu. Authorities were very strict there, however. Only Hindus are allowed inside and must follow stringent rules of dress. Men have to take off their shirts and wear only dhotis (see photograph), and women cannot enter in salwar kameez or pants–only saris. Also, we were told that hubby and I will have to go as a couple. It was a moot point as “Only Hindus” left ML and me out. I only remember being refused entry to a place one other time–that time an Indian restaurant in Washington, D.C. in the late 1960s, that time because I had on slacks. It made me feel awful as I was still fresh from the south. It hit me then how black Americans must have felt not being allowed to use restaurants or other facilities when I was growing up. Which made me feel even worse. Hubby, bless his heart, elected to stay with us and protect us from vendors and curious devotees. So we stayed outside and went as close as we could to take photos, then did what women do to feel better, we went window shopping along the entry. I understand that the inside of the temple is quite beautiful with scenes from Ramayana as well as eye catching sculptures and musical pillars, but only Hindus will ever know for sure. To get back to the hotel, we went in search of an honest auto rickshaw driver. When learning our destination, which was probably less than a mile away by this time, the drivers all quoted the same rate of 30Rs as we’d paid on the trip in. I can’t remember how many inquiries we made before Hubby, determined to find that legendary “honest” auto rickshaw driver in Trivandrum. The difference in 20Rs and 30Rs is–in U.S. dollars– is around 25¢ US, nothing that would break the bank, but for Hubby it was not the money, it was the principle! Finally we found one! One young man, barely out of his teens, offered to take us for 20Rs! 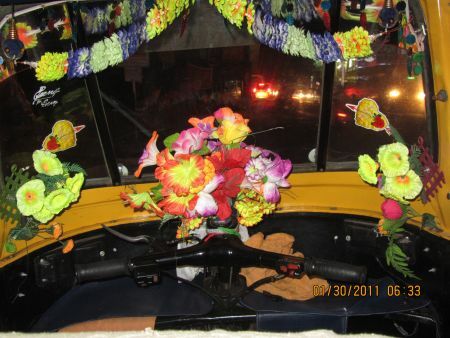 At my first opportunity, while the driver was looking for a new rickshaw (stay tuned and you’ll understand) I took this picture of his rickshaw cab. I don’t know what I expected the cab of an honest driver to look like. As a Christian myself, perhaps a plastic Jesus or Mary? Reconsidering the issue now, I think only a sweet and honest young man would even think of displaying flowers, albeit silk ones. I was very touched. The traffic was very busy that time of evening. We got about half-way back to the hotel when the rickshaw stalled in the middle of a busy intersection. Try as he might, this poor young guy couldn’t get it to start again. Out of gas! Somehow he managed to get it over to the side of the road, where he would help us find another driver to take us the rest of the way. I was feeling so sorry for the young driver, who refused to take any payment. I leaned over to Hubby and suggested we give him at least part of the fare, which he did since he’d had the same thought himself. Still the young man refused to accept payment. We changed cabs, and just as we pulled out again–with a new driver–Hubby asked the fare for the short ride and was told 30Rs, which of course he refused and we pulled over and got out of the vehicle. Long story short, we accepted an offer from still another driver of 20Rs to take us the rest of the way. It was only about a half mile or less, but my leg was aching so we accepted it. I still worry about that thin, hard-working young man I now consider perhaps the most honest auto rickshaw driver in Trivandrum. One last beach on our agenda, this one the Kovalam Beach, has rocky picturesque outcroppings as well as shallow water for swimming. The surrounding hills are lined with palm trees and have lots of shops that we had no time to explore. In fact we spent very little time here. We were glad to have had the opportunity–Raj and Vasanti particularly as they hadn’t been there in 40 years–but by that time my leg injury (in Goa) was really becoming bothersome and I was loath to keep on trying to walk in sinking beach sand. 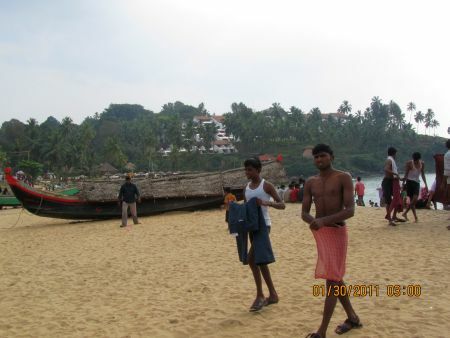 The young men in this picture featuring only one are wearing beach Lungis. Similar to the dhoti most commonly made of thin white cotton, the lungi is made of bright colors or decorated with colorful patterns and worn long or short. In the southeastern U.S., where I grew up, we like to think of ourselves as among the most hospitable of the country. That was the example I was given as a child, and it was largely correct, except there were unspoken caveats (such as being the right color, the right religion, and various other things). One of the things I love about the Indian culture–and I can only speak to my experience–is that it doesn’t matter who or what you are, if you’re a guest in their country, you will be treated with a generosity of spirit I’ve never seen equaled anywhere. I’m convinced that’s probably the reason they were occupied historically by so many other more aggressive cultures. A good example: When we knew we would be in Trivandrum, we planned a short visit to meet the parents of one Hubby’s niece’s husband Anand who lives in California. As it turned out, we arrived and checked into our hotel rather late in the day, all of us–particularly me–very tired so we decided to call Anand’s parents with our apologies. It was decided that they would visit us at our hotel instead. 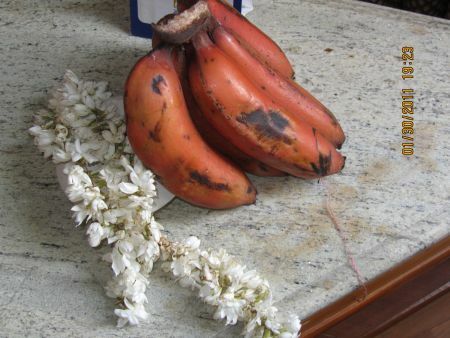 Gift giving seems to be customary in India for they showed up bearing gifts, among which were these red bananas (specialty of the area) and an aromatic flower garland. They were not only very nice, well-traveled people, but very pleasant conversationalists as well. If I’m ever in their lovely city again, I’ll make certain to carve out more time to include a visit to their home. At the Trivandrum airport the next day we said goodbye to Raj and Vasanti. With our friend ML, who would be leaving India in a couple of days, we took a flight to Bombay where we were collected by Hubby’s nephew, Raghu. After a family dinner it was hasta la vista to ML who was staying the night at a hotel near the airport. We had become so accustomed to her being around, and it had been enjoyable sharing India with an old friend. We missed her. Personally I was looking forward to some “down time” to let my leg injury heal. Although we didn’t know it at the time, that Bombay stay would lead to many more memorable places and things and people. New adventures awaited. Next stop will feature a family visit in Nagpur. 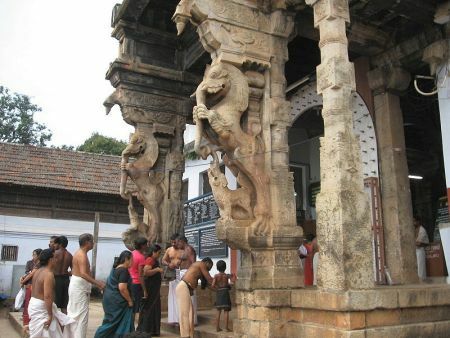 This entry was posted in International Travel, musing and tagged Hindu, Hindu temple, India, Kerala, Mahatma Gandhi, Mohandas Karamchand Gandhi, Thiruvananthapuram, United States, University of Kerala by Alice. Bookmark the permalink. A – I’m beginning to believe that people are by nature the most hospitable in the world in their world. I found my German, Chinese, Spanish and Italian friends to be so hospitable, I thought I had landed in a bowl of honey the way they treated me. I can’t wait for India if you find them as generous of spirit and hospitality – you know it is something us Southerners pride ourselves on and New Orleans doubly. I’m up in my office sifting through bills and now I’m dreaming of India again – thanks A! Hello Aunty : Did I read it correctly – difference between Rs. 30 and Rs 20 = USD 1 ? Nope. 1 USD = Rs. 45 so the difference is about 0.25 USD. But Uncle is right. It is the principle and not the amount. No point in letting anyone fleece your even a few cents.. Bargaining is essential not just to get a good deal but also to prevent unfair practice. Cheers ! What a great trip! I wish I could have been with you. How often do you think our taxi drivers, or other service people are honest with tourists here? I hope you’ll excuse my cynicism but how can you be sure the 4 a.m. auspicious timing isn’t as much for the priest’s convenience, particularly if he has a couple more stops during the day. I’m thinking specifically of the fact that what should be–as the duck flies–a 20 or 30 minute drive in Bombay takes three or more hours. Unless you understand star alignment yourself, plus the Tamil calendar, how would you be sure the auspicious timing is for the event rather than the convenience of a busy priest? 🙄 As for the strictness of the Hinduism, it’s really okay. I was trying to think whether churches here would exclude anybody at all who wanted to go in, seeing as how they’re so interested in conversion. Southern Baptists, especially–in my childhood at least–are known for their going out to shake the bushes in their efforts to convert. Then I remembered I live in Mormon country, and only members are allowed in the temple. Religion never bores me, but I have to be careful with whom I discuss it. Of course, Aunty, you are right. We have gregorian calenders commercially available where the auspicious dates are marked. It is deciding which time of that day is suitable for which ritual that requires a priest to be consulted. And therein lies the opportunity for the priest.I am also sure the timings were decided as per his convenience more than anything else. The three ceremonies would have netted him a cool thousand dollars. Not bad takings for a sunday ! I suppose there are restrictive practices in many demoninations. We know the Parsi Fire Temples are open only to Zorastrians and mosques only to muslim males while Jain temples are out of bounds for menstruating women. ( I haven’t heard of any Sikh or Buddhist shrines being closed to anyone.) I only wanted to say that orthodoxy is getting diluted with time. So maybe a day will come when all shrines will be open to all. Fascinating. I’m glued to every word, then I get to the notes and find myself again reading every word. Thank you. Eventually I am getting round to catching up. I saved your posts until my eye settled and a quiet time when I could digest them properly. The blog and the comments today were wonderful and informative. I will be sad when the India Saga comes to an end. Bless you, Grannymar! For awhile it seemed as if that would never be…but I am getting close now. Some of my favorites are still to come though. You can see this was a very eventful trip for me especially. 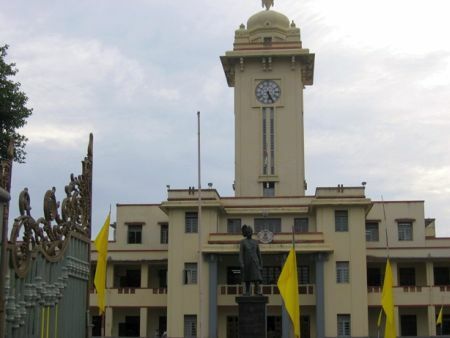 I am from and grew up in Trivandrum (though am living in Chennai now). I was reading this post yesterday — really enjoyed it. I am glad you liked the place and I learned a bit about my hometown — that Gandhiji once called it “evergreen city”! Never knew that. A great post, really. I have some misgivings about the comments about the priest choosing a time of his convenience — though I don’t know the priest, be aware that the Ganapathy Homam (I hope that was the first pooja since the comment mentioned Ganesha) is traditionally done very early in the morning — around 4-5am. How can it be that I’ve only just discovered this comment in March 2018!? Whatever, full disclosure compels me to point out that the photo I’ve used in my blog was taken by ME. If it was used on Rediff, as I see it was, it was taken from this blog. When or if I use web-gained photographs I list the source in the post.